Maria Theresa of Austria (May 13, 1717 – November 29, 1780) was the only female head of the Habsburg Dynasty. She was the Holy Roman Empress, queen of Hungary and Bohemia, and archduchess of Austria. During her rule she changed the royal palace outside Vienna (the Austrian capital) to look much like Versailles. Vienna itself became an important center for the arts, especially music. Maria Theresa added support to her absolute power by tightening her hold on the government. She also improved conditions for the peasants. She is generally known to history as the Empress Maria Theresa. Maria Theresa of Austria in 1772. 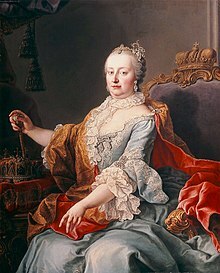 Maria Theresa was born in Vienna, Austria, on May 13, 1717. Her parents were Charles VI, Holy Roman Emperor and Elisabeth Christine of Brunswick-Wolfenbüttel. Her father had made the Pragmatic Sanction of 1713, a decree which allowed a female ruler despite the Salic law prohibition. Maria Theresa died in Vienna, Austria, on November 29, 1780. She was the Archduchess of Austria and queen of Bohemia and Hungary. Oldest daughter of Charles VI. This page was last changed on 7 December 2018, at 04:16.